The first heavy rain hit Northern Iran on 21st March 2019, and the second one hit southern and central Iran after just a few days. According to the authorities, most of the people in Pol-e Dokhtar town in Lorestan province were trapped in balconies and rooftops due to the huge amount of water on the streets (reference: https://www.presstv.com/Detail/2019/04/02/592406/Iran-Flood-Rescue-Operation). 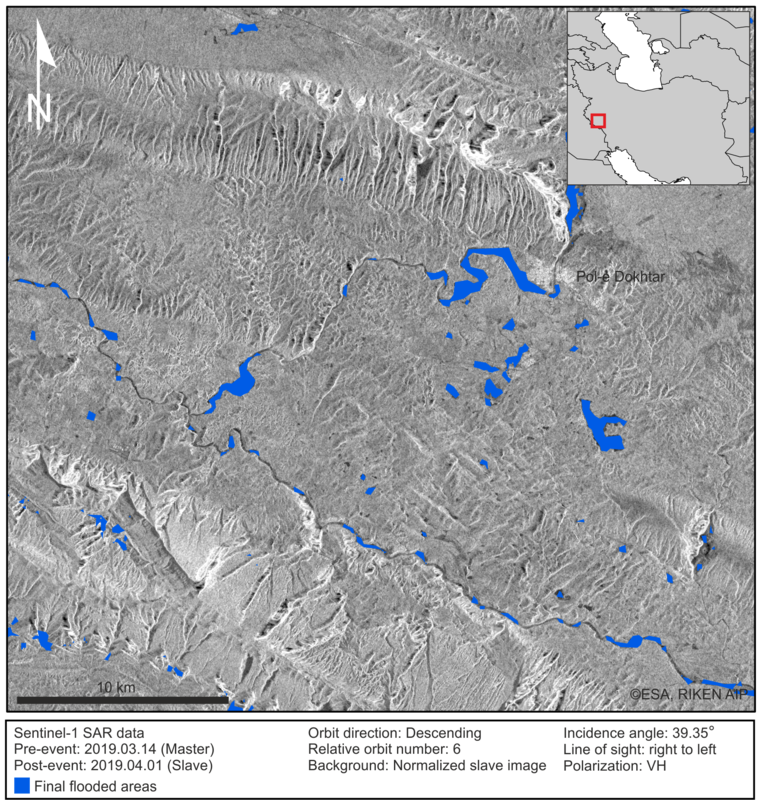 Geoinformatics Unit at RIKEN AIP created a preliminary flood map of Lorestan province (Pol-e Dokhtar) using Sentinel-1 Synthetic Aperture Radar (SAR) data. To detect the flooded areas, we carried out a change detection analysis using pre-event and post-event SAR images obtained on 13th March 2019, and 1st April 2019, respectively. Figure 1 shows detected flooded areas (blue segments) in a region around Pol-e Dokhtar, Iran. In Figure 2, RGB InSAR coherence map shows the urban changes in Pol-e Dokhtar town and its surrounding areas in Lorestan province, Iran using multitemporal InSAR analysis. A normalized difference in InSAR coherence (pre-event - post-event) is considered in red band to reflect building changes as "forward change" which is associated with urban damage or change and a normalized difference in InSAR coherence (post-event - pre-event) in green band which reflects some characteristics of vegetation growth or post-event human changes (reverse change). The average value of two InSAR coherence products in blue band means "no change". Urban areas were illuminated by Global Urban Footprint (GUF), and damage in the eastern part of Pol-e Dokhtar is observable, also in the upstream, in the way of an overflowing river, there are small drowned urban regions. Disclaimer: The results of flood monitoring are initial information for general purposes. They should not be used for detailed projects or engineering demands. Figure 1. Detected floods (blue areas) in a region around Pol-e Dokhtar, Iran. Figure 2. RGB InSAR coherence map shows the urban changes in Pol-e Dokhtar town and its surrounding areas in Lorestan province, Iran.